When a state governor stands in the lobby of a new hotel and pledges support to ensure it is "sold out every night," you know this is no ordinary establishment. Hotel Vermont (check rates and recent reviews at Trip Advisor) is the state's first independent hotel to open in 40 years, and it's more than a hip place for Burlington visitors to rest their heads. Owned by entrepreneurial Vermonters and built with environmental sensitivity and a commitment to local producers of everything from furniture to flannel robes to food, Hotel Vermont is a vibrant showcase for all that makes Vermont singular among the nation's 50 states. On this photo tour from my stay during the opening celebration, you'll see how thoughtful details and practices combine to make Hotel Vermont a true reflection of its location, with an ambience you won't find anywhere else on earth. In his grand opening remarks, Governor Shumlin lamented only one thing: "How come no one thought of this [sooner]?" Truth is, the newly constructed, six-story hotel at 41 Cherry Street is not the first Hotel Vermont. The original Hotel Vermont at the corner of Main and Saint Paul Streets was the epitome of elegance and the state's largest hotel when it opened in Burlington in 1911. You can walk past the historic Colonial Revival-style brick building, now called the Historic Vermont House, while you're visiting the city. It was converted to residential and commercial space after the hotel ceased operations in 1970. 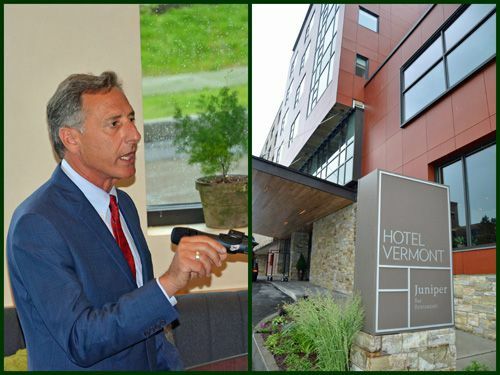 Like its namesake, the all-new Hotel Vermont was conceived to be a reason alone to visit Vermont's largest city, as well as a gathering place for Vermonters. Step into the lobby of Hotel Vermont, and you immediately sense this is a hotel for a new chapter in Burlington's history. Contemporary in every way, this urban hideaway also honors the state's natural beauty. In the lobby, for example, the flooring is speckled with local lake shells, and granite-block columns evoke Vermont's mountain landscapes. TruexCullins of Burlington handled the interior design. Nestle into a comfy, Vermont-made Beeken Parsons chair by the wood-burning fireplace and blaze through work: the free 100Mbps synchronous broadband internet access provided through a partnership with Burlington Telecom is the fastest speed available in Vermont. At Juniper, Hotel Vermont's bar and restaurant overlooking the lobby, Chef de Cuisine and Vermont native Douglas Paine oversees a menu of light evening fare and hearty breakfasts made with fresh, decadent local ingredients. Former Head Bartender Eben Hill created a similarly inspired cocktail line-up featuring spirits crafted by all 11 of Vermont's micro-distilleries. "There is nothing mediocre coming out of Vermont," says the renowned mixologist, whose concoctions include the Cider Press, made with Green Mountain organic lemon vodka, WhistlePig double barrel-aged rye whiskey and Vermont apple cider. New Head Bartender Nick Roy continues this focus on locally distilled spirits in cocktails like the Pumpkin Patch. Inquire about mixology classes the hotel plans to offer for guests who want to learn the art of mixing drinks with Vermont-made spirits. Beer lovers can sample a variety of Vermont brews on tap, and wine connoisseurs will discover a list of organic and biodynamic reds and whites. Smith Buckley Architects of Burlington took on the challenge of designing an upscale, ultramodern hotel to fit a narrow site: The structure even had to wrap around an existing parking garage. Local developers Jay Canning and Chuck DesLauriers, who have owned hospitality businesses in the state since the 1950s, also selected a South Burlington-based general contractor: PC Construction. This time lapse video shows how the hotel came to life. The bar at Juniper overlooks one of three "green roofs": outdoor terraces that require cultivating and mowing. All offer guests prime places to relax with views of Lake Champlain and New York's Adirondack Mountains. Hotel Vermont is expected to meet the requirements for LEED Silver Certification from the US Green Building Council. My room at Hotel Vermont was a Whirlpool King: a perfect choice for couples. The room's sleek design features luxurious bedding, a gas fireplace, 40" flatscreen TV, energy-efficient LED lighting and more electrical outlets than I've ever seen in a hotel room. The bathroom in my Whirlpool King room at Hotel Vermont had both a sunken whirlpool tub and a walk-in shower. While the toilet is in a separate enclosure, the rest of the room is very open, so you may not want to book this room category if you're not comfortable showering in front of your travel companion. Other rooms at the Hotel Vermont are much more family-friendly. Double rooms are available, and some king rooms even have a cool, pull-out twin trundle bed. Fun! Whether you are visiting Burlington for business or leisure, Hotel Vermont's convenient location puts you within a short walk of both the Lake Champlain waterfront and Church Street Marketplace's shops and restaurants. It is also a nearby choice for families visiting the University of Vermont (UVM). A fleet of bikes refurbished by Burlington's Old Spokes Home is available free for hotel guests who want to explore even farther afield. Vermont craftsmanship and pride is everywhere on display at Hotel Vermont. It's in the design and building materials—many indigenous and some reclaimed—of the structure itself. And it's in every little amenity and detail. Toiletries by Burlington-based Lunaroma including Lemon Eucalyptus Shampoo, Rosewood Bergamot Conditioner and Organic Lemon Grapefruit Orange Shower Gel. This video introduces many of the Vermont makers who have partnered with the hotel to provide a uniquely Vermont experience for guests. Each hotel floor has a refreshment pantry stocked round the clock with complimentary local coffee and tea. Just how far has Hotel Vermont gone to create an immersive Vermont experience for guests? Bathroom wastebaskets are repurposed maple sap buckets. And, hanging in the closet, you'll find Red Buffalo plaid robes from the Vermont Flannel Company in East Barre. Great lengths were also taken to hire a diverse team of "real characters" to serve guests of the hotel, said General Manager Hans van Wees, an experienced and energetic hospitality professional who previously managed the Trapp Family Lodge in Stowe, Vermont. Rather than rule out applicants by ruffling through resumes, the workathotelvermont.com Web site invited anyone interested in working for the hotel to book a 10-minute, in-person appointment. It was a foot in the door that some Vermonters had not realized in two years of job searching, and, says van Wees: "What we wound up with was a diverse mix of people—all with stories: a real melting pot of interesting people." As a travel writer, I've had the opportunity to kick the tires at many brand new hotels, and often, I've found the service to be not yet up to expectations during those early months. Hotel Vermont was the rare exception, where employees I encountered were well-trained, professional and, even in moments of uncertainty, well-intentioned when it came to providing what I needed. "We are constantly learning," van Wees said of the culture. His guiding philosophy is: "If you didn't learn something that day, it's a day lost." I first met Chef Eric Warnstedt when he teamed with Vermont's best chefs to prepare a seven-course dinner at the famed James Beard House in New York City in 2010. It was the most delicious evening of my life, and Warnstedt's lobster dish was my favorite course. Since then, the chef-owner of Hen of the Wood in Waterbury, Vermont, has twice been a James Beard Foundation Best Chef: Northeast nominee, and his notoriety is guaranteed to soar with the debut of a second Hen of the Wood at the Hotel Vermont in Burlington. Crispy Pork Belly, Ginger, Pickled Strawberries & Cilantro. Hen of the Wood in Waterbury is tiny and geared for special occasions: Advance reservations are a must. Warnstedt said the new Burlington location will be twice the size and able to cater to a casual crowd of walk-in dinner guests eager to try his inventive, beautifully executed cuisine. At night, the restaurant's butcher room will be transformed into a private dining venue for groups of up to 10 adventurous guests. Warnstedt is renowned for serving the best of what's fresh from Vermont's farms and gourmet food producers. With their shared commitment to local vendors, Hotel Vermont's partnership with Hen of the Wood is a perfect marriage. Even breakfast is a gourmet experience at Hotel Vermont. The asparagus and poached duck egg with sea salt I ordered is considered one of the "light" items on the breakfast menu at Juniper. I wasn't hungry again until suppertime. Hotel Vermont is located at 41 Cherry Street in Burlington, VT. Reservations may be made online or by calling 802-651-0080 or toll free, 855-650-0080. The price of an overnight stay at Hotel Vermont, which started at $229 as of the grand opening, is likely to climb as word spreads and demand explodes. The 125-room hotel is entirely smoke-free. A few rooms are dog-friendly. Accessible rooms that meet ADA guidelines are available by request. Valet and self-park options are both available for a fee. Electric vehicle plug-in parking is free. Burlington International Airport is a three-mile cab ride away (check flight prices).